Sometimes, it may be required to exclude one or more subdirectories from the duplicate files detection process. For example, if you need to find all duplicate files on a disk excluding one or two special directories, you may specify the whole disk as an input directory and add the directories that should be skipped to the exclude list. 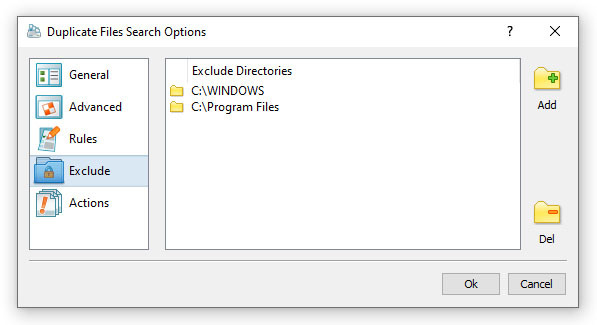 In order to add one or more directories to the exclude list, open the duplicate files search command dialog, select the 'Exclude' tab and specify one or more directories that should be excluded. All files and subdirectories located in the specified exclude directories will be excluded from the duplicate files search process. In addition, advanced users are provided with a number of exclude directories macro commands allowing one to exclude multiple directories using a single macro command. $BEGINS <Text String> - this macro command excludes all directories beginning with the specified text string. $CONTAINS <Text String> - this macro command excludes all directories containing the specified text string. $ENDS <Text String> - this macro command excludes directories ending with the specified text string. $REGEX <Regular Expression> - this macro command excludes all directories matching the specified regular expression. For example, the exclude macro command '$CONTAINS Temporary Files' will exclude all directories with 'Temporary Files' at any place in the full directory path and the exclude macro command '$REGEX \. (TMP|TEMP)$' will exclude all directories ending with '.TMP' or '.TEMP'.